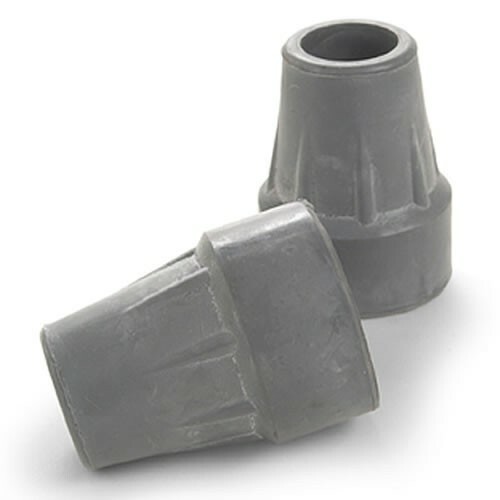 Crutch Tips by Invacare with 0.85 Inch Inside Diameter, 1.75 Inch or 2 Inch Outside Diameter at Base. The tips aren't very good. You will get one set that will last for weeks and the next few sets might only last a day before ripping. Now they don't have the value to make them worth it less then two years ago they were under Two Dollars and worth it then. For over Ten Dollars avoid. These crutch tips last longer than other tips I have tried and they have really good grip. I've walked on crutches for a very long time and have had trouble finding good tips. These tips are wearing very well. I had just about given up trying to find a crutch tip that would last over two weeks without the tip peeling. I will be ordering more of these tips in the near future. These are manufactured overseas using cheap rubber. They are not alone as other tips are made the same. If you are on crutches for a long period of time, these are not for you. I'm happy, as far as the cost $ and the service especially fast delivery to my door!!! The tips I ordered arrived fast and was at a great price will definitely order again when I need more. Delivery was fast. I ordered on the 11th of April and received them two days later. When I first opened the box I was impressed. The crutch tips seemed of a heavy weight and looked solid. I am now on my second pair. The first pair only lasted 2 wks. Both pair started tearing away from the bottom outside by the 2nd day. The first pair was completely smooth on the bottom by the end of the second week. I guess if I wanted to order them in mass quantities it would average out to $1 a week for crutch tips, but I don't think my husband wants to change them every two weeks. I am a polio survivor and I need more reliable crutch tips than these....I will have to keep searching. Delivery was prompt; received product as expected. This has been the best online buying experience by far when it comes to mobility equipment! Will visit often!! !